This was an extremely informal meeting that was neither called to order nor adjourned. No executive meeting summary was circulated. The Celestron power cord miraculously reappeared. Members viewed the ceiling baffle prototype constructed by Bob Nelson. The plywood pier mounting plates for Meade and Celestron wedges were previewed. Tour on February 9th. Host and assistant required. John Ascah’s PowerPoint presentation included some NASA images from the Spitzer and Chandra telescopes. Also shown were some images of the construction work done last summer. This entry was posted in 2003 / 2004, Meeting Minutes on January 28, 2004 by glen_h. Motion: Table a motion to bring up the subject at the April 2004 executive meeting to spend the rest of the gaming money. Motion: To renew at US$50 the IDA membership. The Executive will promote participation in the RASC Explore the Universe program. Further discussion with optometrist John Bosdet regarding mirror grinding will be done by Glen and possibly Maurice. February 24 6:00 p.m. Westwood School Wayne will give a short presentation to the Sparks group. John Ascah will do the main talk. This entry was posted in 2003 / 2004, Meeting Minutes on January 14, 2004 by glen_h. 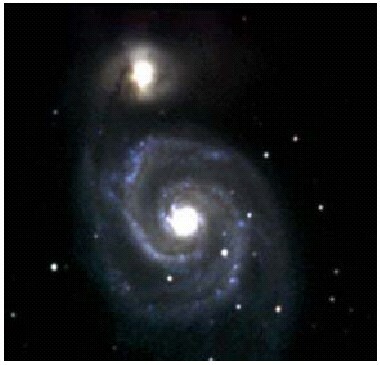 Photography Method: 70 minute picture of M51: 10 min clear, 10 min R, 20 min V (green), and 30 min B. After suitable processing (removing excess background, clearing away cosmic ray traces, registering and summing each colour, rotating and registering the 4 colours), I combined the 4 images to produce this colour image. It’s not the greatest image of this galaxy, but one that I am happy with since it represents my best to date. BTW, almost all frames were 2 minutes unguided. Seeing was fair to good at 2.6″ and the atmosphere very clear (for these parts). This entry was posted in Astro Photos of the Month on January 13, 2004 by glen_h.